Simple tactics are usually the most effective ones. 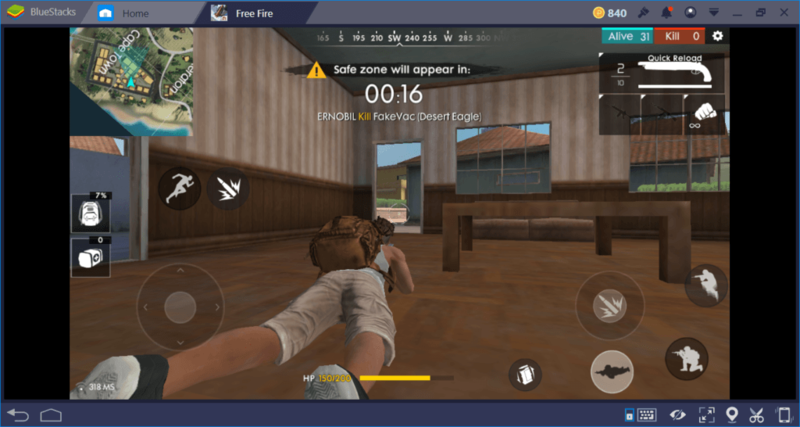 This is what we are doing with this guide: Providing you simple yet effective tactics for Free Fire. Whether you are a beginner or an expert, you can be sure that our recommendations will help you to become the king of the island. Let’s start: This island is not big enough for 50 players and there can be only one survivor. In a very short time after you have jumped from the plane, you can open the parachute. Do not do this. Opening a parachute will slow down your descent and cause you to land later than your opponents. Players who land before you can still shoot you while you are still in the air: We have seen this many times before. (By the way, you can do the same thing to others.) The game will automatically open the parachute when you get close to the ground, so you do not have to worry about it. As soon as you land, start running: This is not a good time to enter combat. We gave detailed information about this topic in our Where to Land Guide, but let’s repeat it once again: There will be a lot of combat in cities, so stay away from them at the beginning. Your goal should be to get as far away from other players as possible: Let them kill each other. Try to be the last person to jump from the plane, in order to land in a quiet spot. The middle of the map (Power Plant region) is where players are most intense, so if you land here, use a car to go somewhere else as soon as possible. Do not use vehicles during solo play unless it is an emergency. Vehicles make a lot of noise and can be easily seen even from meters away. If you have to use a vehicle, do that only for a very short time. After getting off the vehicle, move away from the area as soon as possible. If you are playing on a team, you can be more comfortable in this regard: One of you can drive while the other is shooting. Driving is only useful if you are playing on a team. In solo play, it is a suicide mission. Most players try to find weapons first. But you need to concentrate on finding armor. Even if you have the best weapon in the game, a sniper bullet will be enough to kill you if you do not equip armor. Your “head” is most prone to damage, so try to find a helmet first. Headshots are very damaging and can kill you in one hit – you must protect your head before anything else. Even if you do not have any weapons, equipping armor at a sufficient level will allow you to escape from combat. Live to fight another day, that is your motto. From time to time, you will see loot crates literally falling down from the sky. They are called “airdrops” and these crates contain the best weapons and armor in the game. You will feel an “irresistible” desire to run to the crate, but do not hurry. Other players also saw the same drop and there are probably dozens of people running to the same spot. Forget the crate: Instead, move towards where it fell and prepare an ambush from a nearby spot. You can kill a couple of your opponents from a distance easily. Remember that greedy players will not survive for long in Free Fire. If you have managed to reach the end-game phase, then your inventory is already filled with many weapons and equipment. Do not be greedy: You need to focus on survival at this stage, not on finding new loot. Do not pursue more weapons if you are satisfied with your current setup. 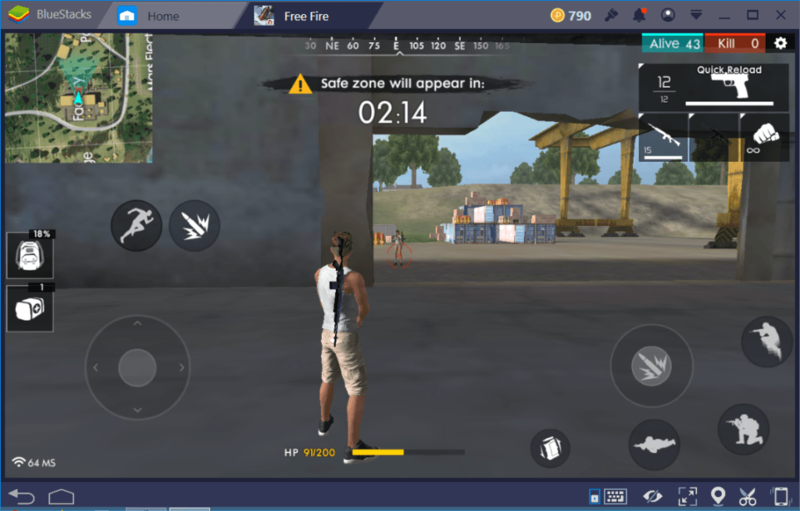 The difference between weapons is not that noticeable in Free Fire. There is no need to “upgrade” your assault rifle if you are happy with it. There’s no point in filling your inventory with more weapons: Focus on medkits instead. And remember that the loot you see in a room can be a trap: A sniper might be patiently waiting for a greedy player to fall into it. You may fail to notice the movements on the playing field, but you can’t miss “sounds”. Watch out for sounds the other players make, especially in enclosed spaces, and always play with a headphone. If you listen carefully enough, you can tell which rooms other players have entered and exactly where they are. For the same reason, do not move too fast: Your opponents can also hear you. Yes, we know that we said “start running as soon as you hit the ground” before but that was for the beginning of the game. Rules are different during the end-game phase: You have to stay in motion continuously, but that does not mean you have to run everywhere. A moving object attracts a lot of attention in the field of play. The easiest way to let other players know your location is to run in an open field. Move slowly and carefully, and go prone whenever needed. Stay away from open areas and try to stay inside the buildings or near the buildings. In other words, make sure you are protected from at least one side. Do not forget that you do not have to enter the buildings to check the rooms: You can see inside from outside through the windows. You can see the location of other players on the minimap. When someone shoots, he is shown as a “red arrow” on the map. The tip of the arrow shows which direction the attacker looks at. Use this to your advantage: If you are seeing a red arrow on the minimap, this means there is another player near you and for a short period of time, you can see his exact location. Time for an ambush! Let’s be realistic: No matter how flexible your fingers are, you will not be able to play Free Fire efficiently on the tiny screens of mobile phones. You will eventually press the wrong button and miss an opportunity. 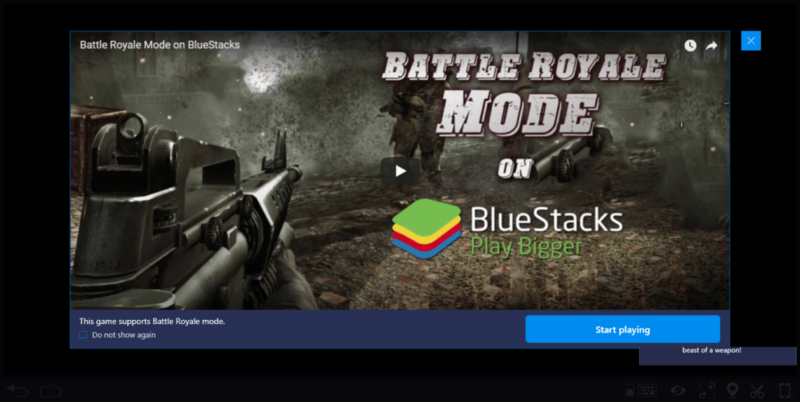 Start using BlueStacks and activate the Battle Royale mode. To be able to use a keyboard and mouse will make your gaming experience much more enjoyable and give you countless advantages. 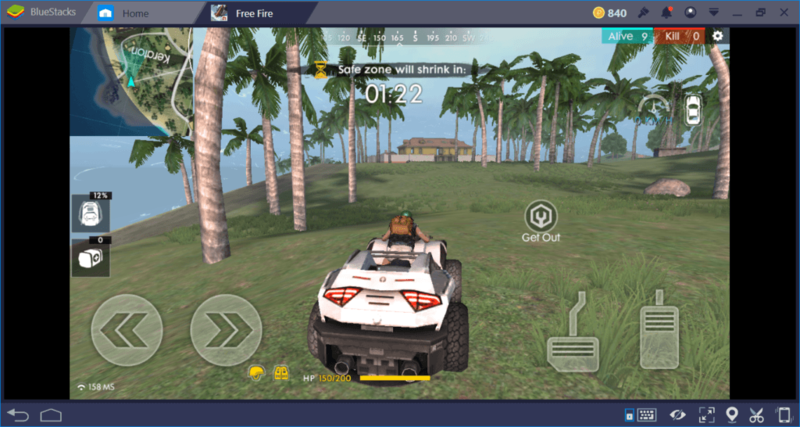 You can move much faster, aim much better, and play Free Fire like a PC FPS. 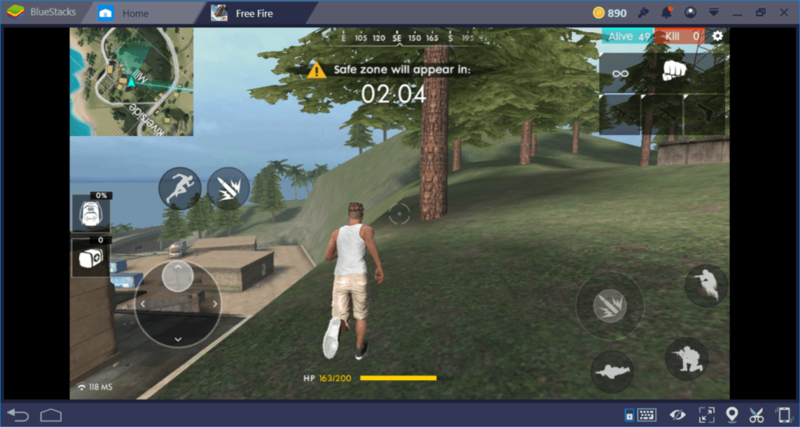 No need to stand still during combat just to be able to use your scope: With BlueStacks, you can keep moving and firing efficiently at the same time. 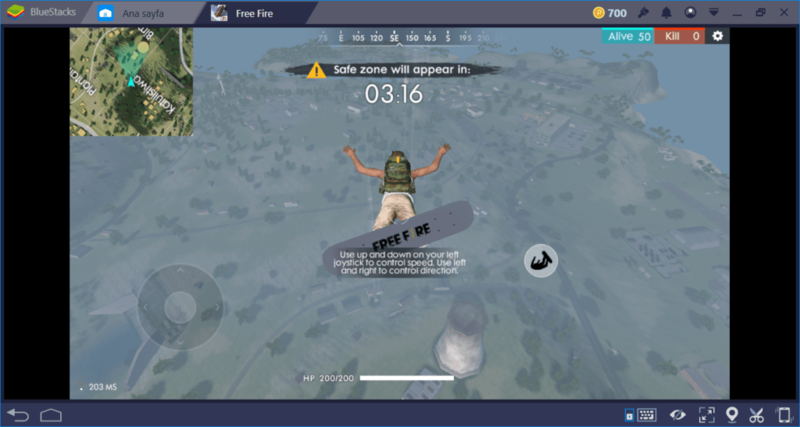 Read more about how to activate Battle Royale Mode for Free Fire in this guide. Need more advice? 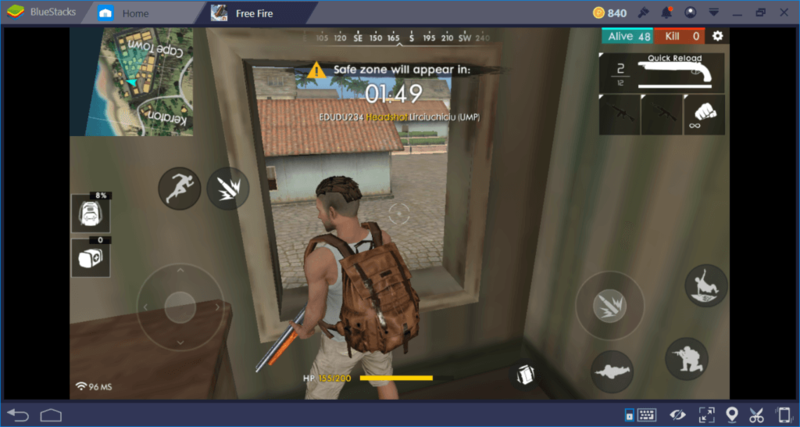 We have prepared lots of guides for Free Fire – continue reading them to learn what to do in different situations. 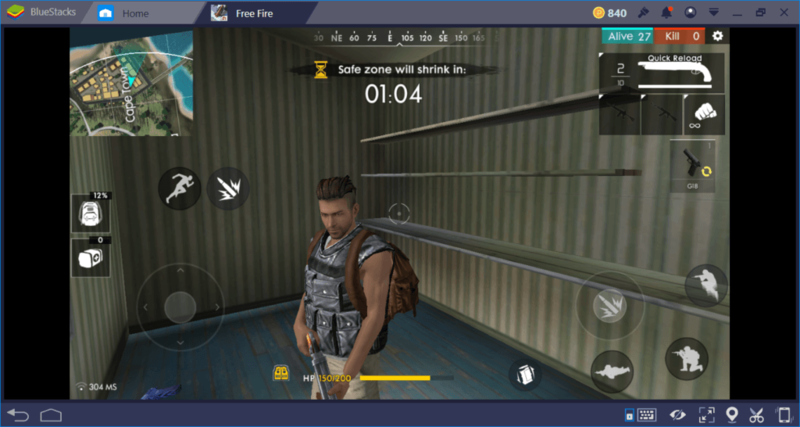 Remember that the island of Free Fire also contains a “chicken dinner” and you can be the one who eats it if you know what you are doing.